They’re not only super delicious but also really fudgy and chocolatey. Plus the recipe really couldn’t be easier! All you need is a food processor or blender, an oven, and a handful of ingredients such as brown beans, cacao, and vegan chocolate chips. 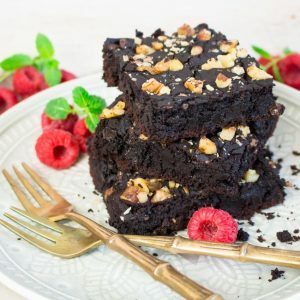 I’m sure people would never guess that these brownies contain black beans instead of flour. They exactly look, smell, and taste like normal brownies. Isn’t this just crazy?! Preheat the oven to 350 degrees (180 °C). Thoroughly rinse and drain the black beans. Grind the flax seeds in a food processor or use store-bought ground flax seeds. Whisk them together with 8 tablespoons of water and set aside to thicken for about 2 minutes..
Then make the batter: Combine all ingredients except the chocolate chips and the walnuts in a food processor and process until smooth (also add the soaked flax seeds). Lightly grease a baking tray and pour in the batter. Add the chocolate chips and spread evenly. Sprinkle with the chopped walnuts. Bake for about 40 minutes. Allow the brownies to cool down before you cut them into pieces. This entry was posted in BLOG and tagged brownies, health, recipe, vegan. Bookmark the permalink.